Happy Saturday Trendy Twine Peeps!!! It's Melissa here, from M Miranda Creations, sharing with you today. It's the last day of February and Spring is almost here. Yay!!! 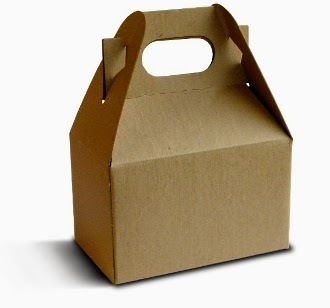 I hope you have been following us all month long as we have been featuring Limeade Trendy Twine and the Kraft Gable Boxes. Is it too early to start getting ready for Easter?! I don't think so!!! I started with the Kraft Gable Box and added panels along all 4 sides around the bottom. The panels are cut at 3 3/4 x 2 1/4 for the front and back and 2 1/4 x 2 1/4 for the sides. I then took my Limeade Trendy Twine and wrapped it around the box 3 times and tied it off using a button. To get my button to stay put I added foam squares to the back of it. I then cut some Peeps from a file from Cuddly Cute Designs, inked the edges, and attached them to the front of the box with some more foam squares. The tag is a file from the Silhouette store and I inked the edges, stamped on the "for my" sentiment, and then ran it through my Cuttlebug using the D'vine Swirls embossing folder. I used the same file from Cuddly Cute Designs to cut out the Peeps file. I inked the edges of this as well, glued it together, and then used foam squares to attach it to the tag. The tag was then attached to the Kraft Gable Box using two lengths of Limeade Trendy Twine and tied in a bow. Thanks so much for taking the time to stop in here at the blog! We appreciate having you here and hope you will leave a comment. We all enjoy reading them! 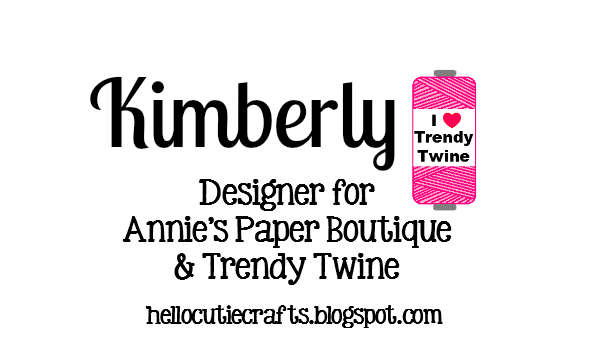 We also invite you to follow Trendy Twine on Facebook and at the Twine It Up! Facebook Group. You're my pot of gold! 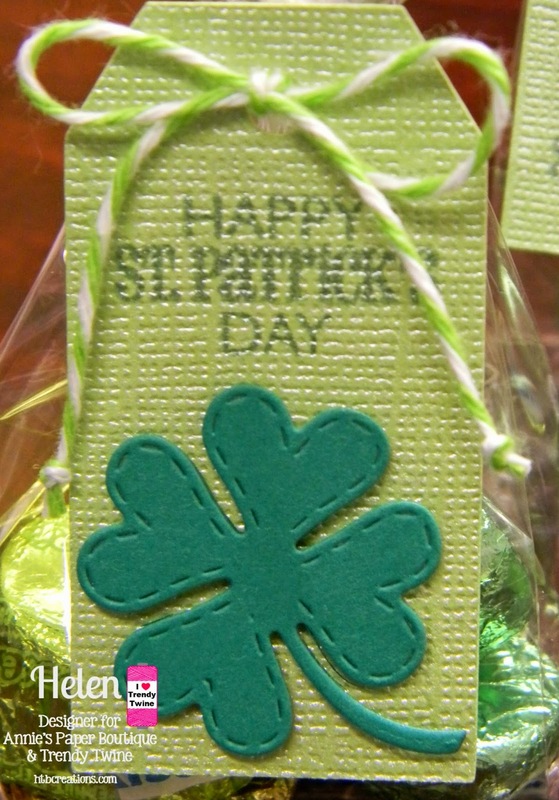 This is Shelly from My Paper Love sharing a little treat for St. Patrick's Day featuring our color of the month Limeade Trendy Twine. Our new neighbors are Irish and they have a big St. Patty's day party and I thought this would be a fun little treat to bring for the kids. 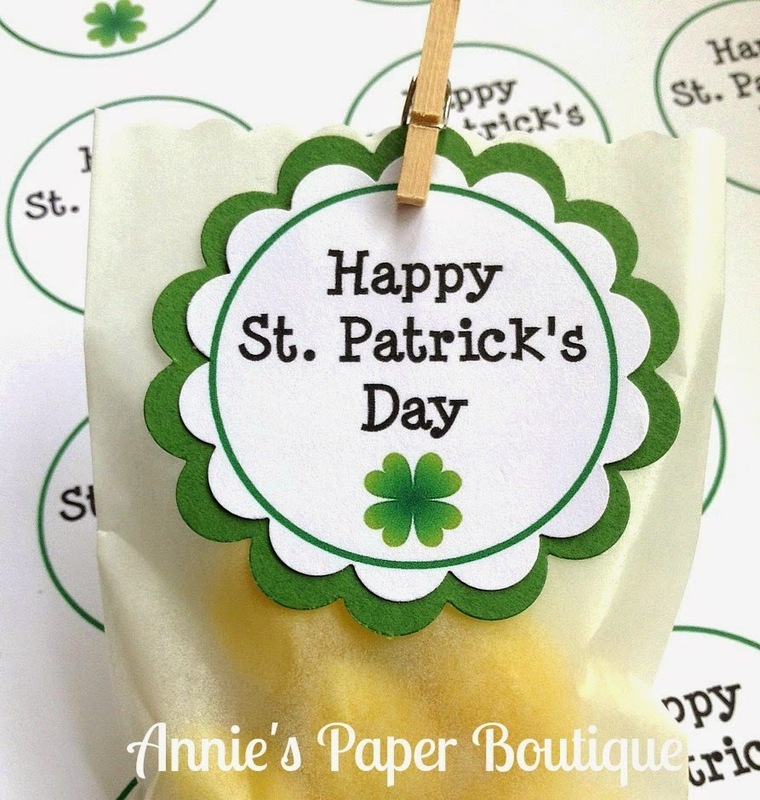 I started with these fun mini treat cups from Annie's Paper Boutique. They were perfect for my pots! Next I had to add the gold :) which are yummy rolo candies that I put in cone bags also from Annie's Paper Boutique. And lastly I tied them up with some Limeade Trendy Twine and attached a fun little tag. I just LOVE how these turned out. 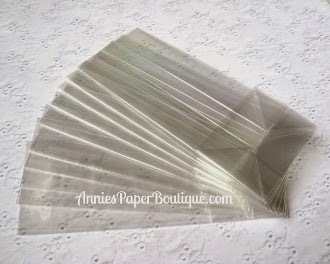 You can find everything you need to make these in the Trendy store Annie's Paper Boutique. Click here to join our Twine It Up Facebook group. Thanks so much for stopping by and have a wonderful day!!! 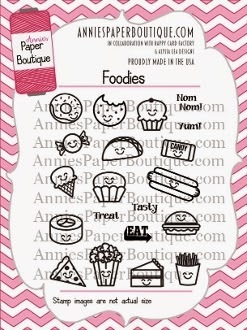 featuring Annie's Paper Boutique planner stamps. I enjoy using these stamps for my Project Life cards. I made some 3x4 cards for when we go out for treats with the kids. 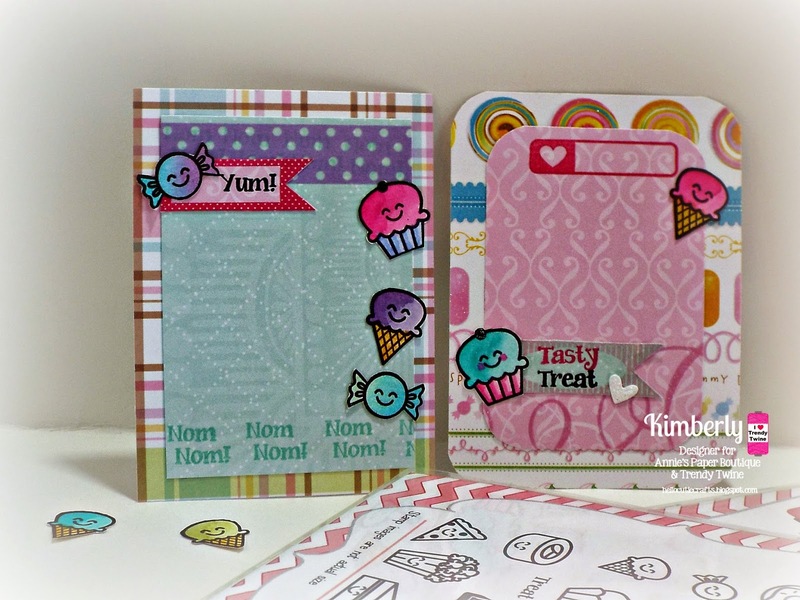 I used Foodies and the *new* Check It Off stamp sets. I water colored the cute little candies, cupcakes and ice cream cones to match the paper. I also stamped the fun banners from Check It Off to add the date to my cards and a sentiments. Look at those stamps! They are just so versatile and fun! 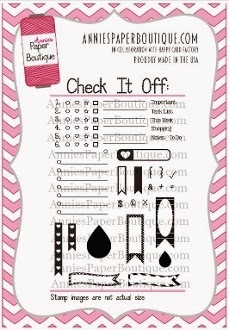 and for your scrapbooking and project life cards. For all the details of my project, please visit my blog. Hello everyone! 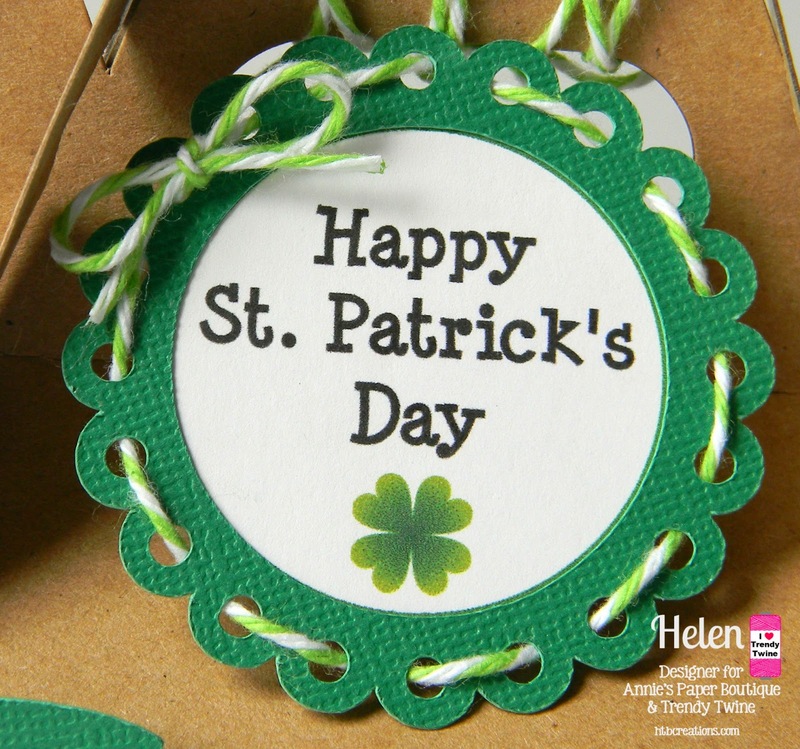 I'm Helen from HTB Creations. We are showcasing the fabulous Limeade Trendy Twine and the fun Kraft Gable Boxes this month. 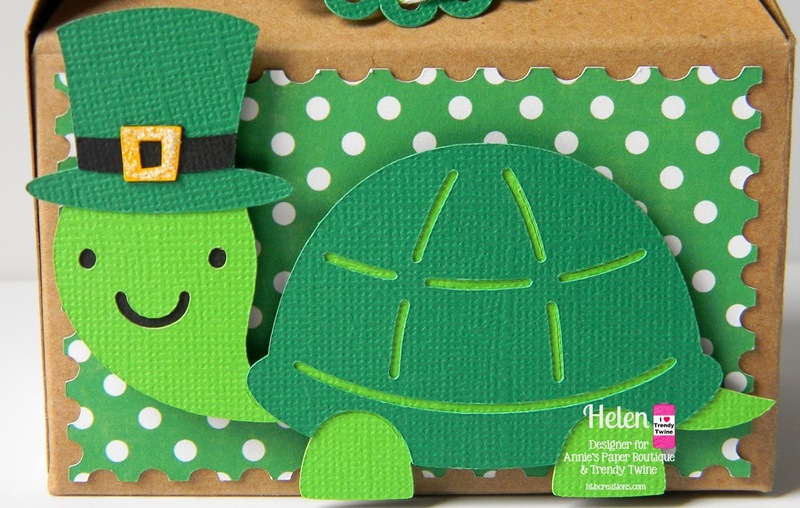 For my box, I also added the St. Patrick's Day Punch and Go Printable that you can get in the store too. The printable is cut out with a 1 3/4 inch circle punch and I cut the scalloped circle out with my Cricut at 2 inches to attach to the printable. I threaded the Limeade Trendy Twine through the scallops and tied a bow. Then I wrapped some around the handle of the Kraft Gable Box and then tied the tag to the twine on the box. 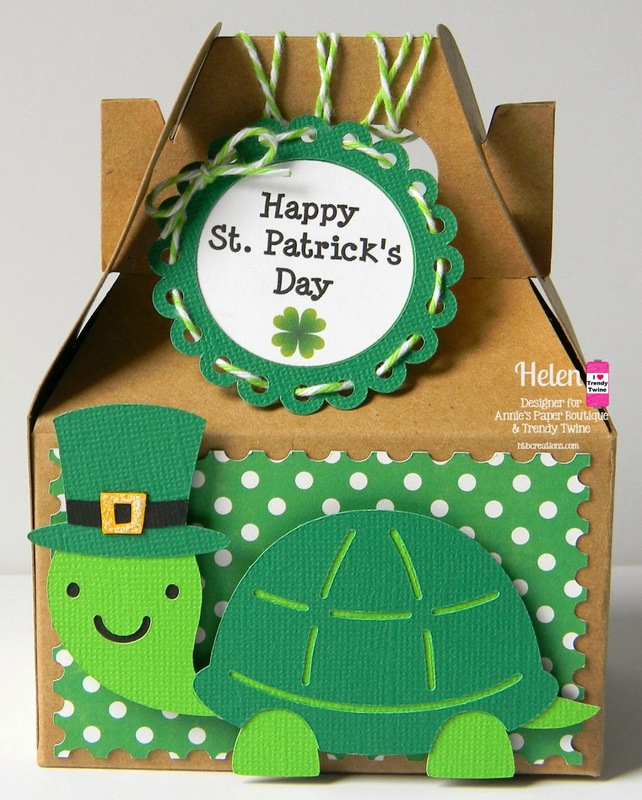 I used some fun polka dot paper for the background of my St. Patrick's Day Turtle. The turtle is cut from the Create a Critter 2 Cricut cartridge. The animals on this cart are so fun to play with! Good morning Trendy Twine friends! 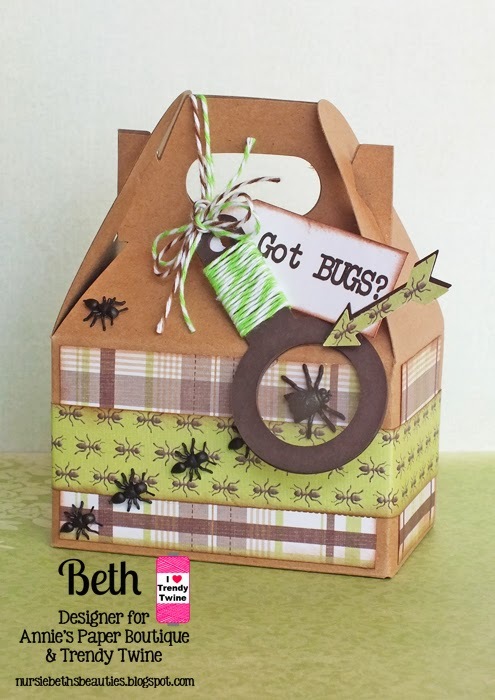 Beth from Beth's Beauties with you and today I am sharing a fun way to package treats for the young boys in our lives! 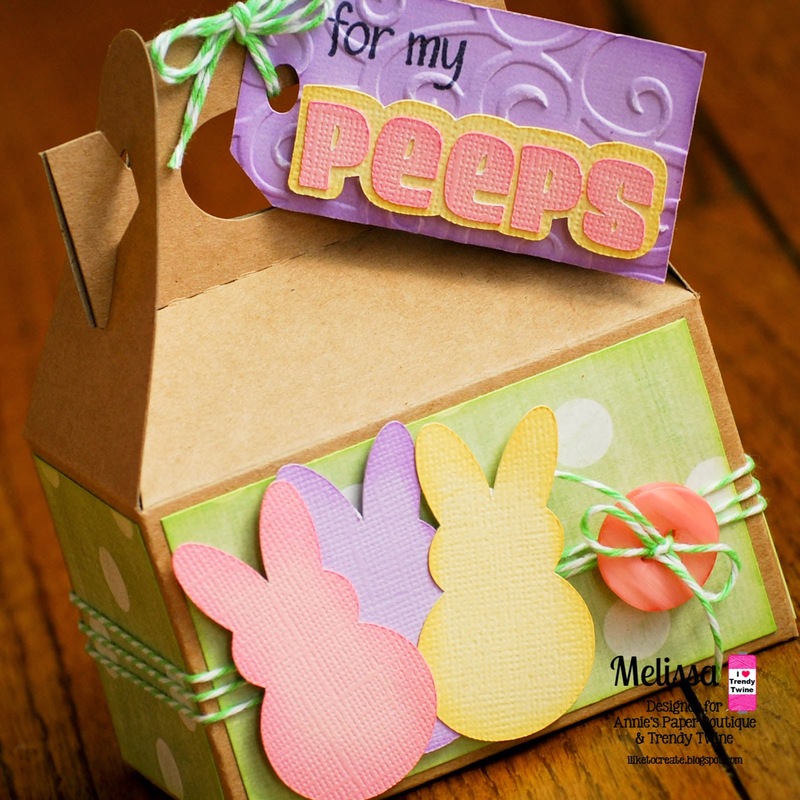 I started out by using a Kraft Gable Box and I had a lot of fun decorating it. I created the magnifying glass in my cutting software, then added a sentiment tag and an arrow. 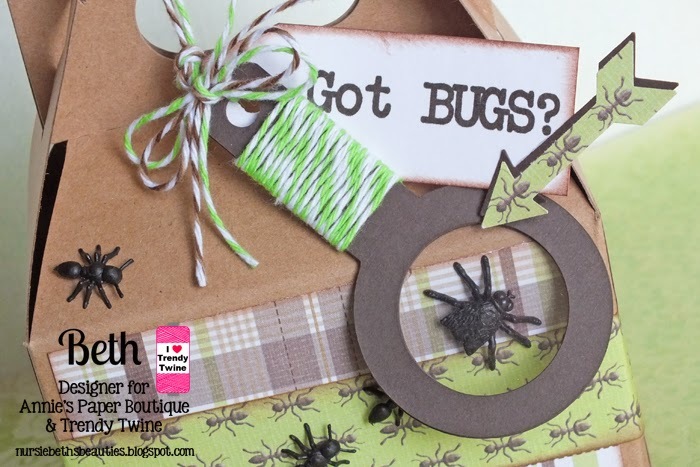 The magnifying glass handle is wrapped with Limeade Trendy Twine. 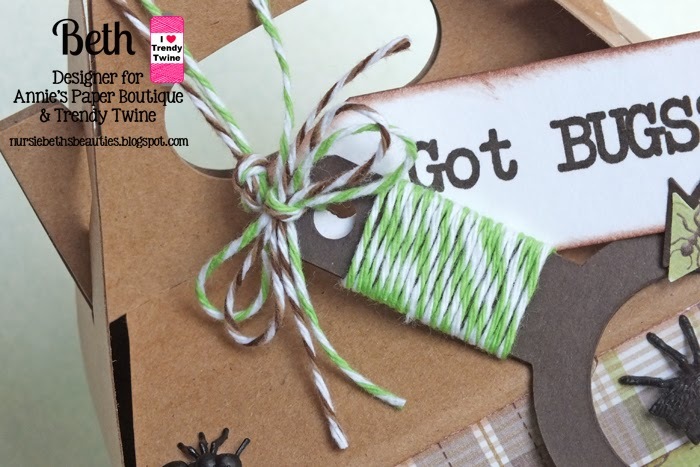 The bow that attached the glass and tag to the handle of the box is made from Chocolate Truffle and Limeade Trendy Twine. 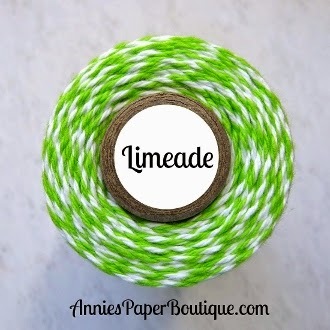 So here is a card sharing some fabulous Limeade Trendy Twine. One of my favorite things to do is use beautiful colored twine as a backdrop behind a negative. I think it looks so pretty on a card and definitely gives lots of visual interest. I hope you enjoyed this card today! 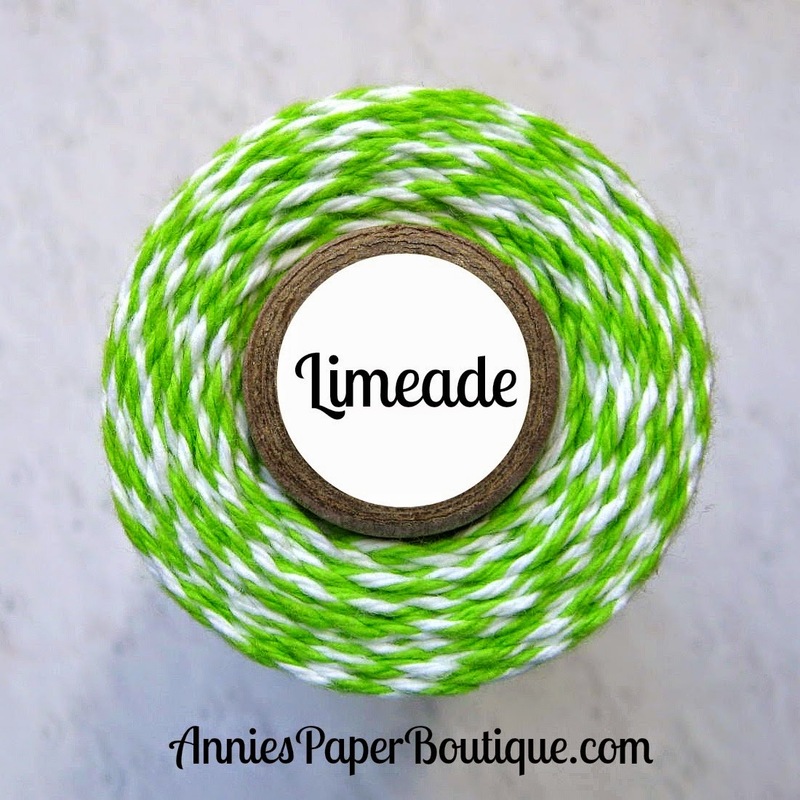 Here is the Limeade Trendy Twine that can be found at Annie's Paper Boutique here. Hello! I am Amanda from She's Eclectic and I am back for the second Planner Friday of the year! 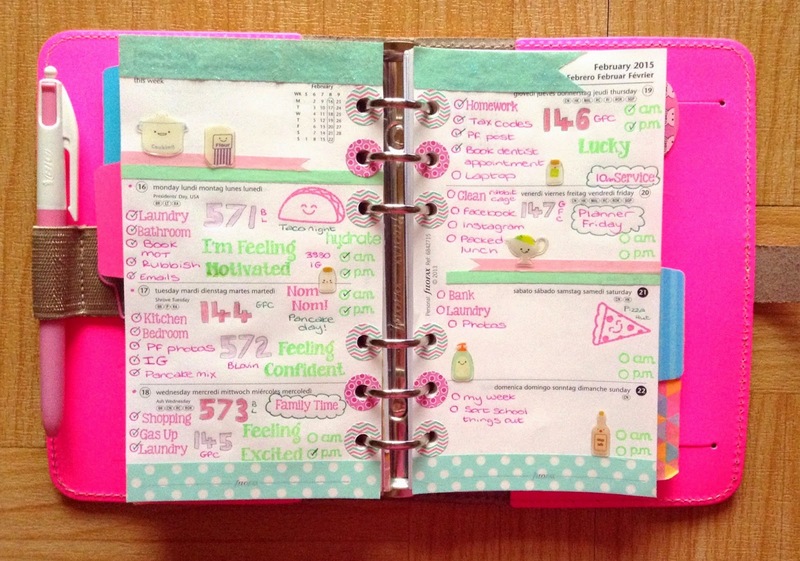 I use my planner to keep me organised but I like to have fun decorating my pages too. 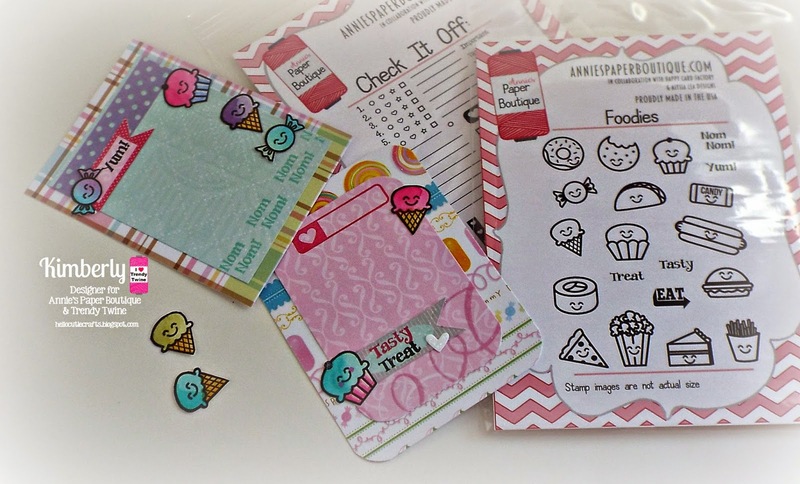 This week I am using these new Foodies Planner Stamps to add a touch of cuteness to my pages. I think they are adorable! I have used them to mark special days in the week like taco night (my favourite! ), Shrove Tuesday and a family trip to Pizza Hut for a treat. The set has a nice mix of word and image stamps so they are very versatile! If I have inspired you to have a go at decorating your planner take a look in the store for some fun goodies to get you started! Hello, this is Sukie and I am sharing a single page 12x12 layout featuring Limeade Trendy Twine. My monster themed layout was created using some fun paper from my stash and I added a die cut layer to the background using the Mother's Day Bouquet cartridge. 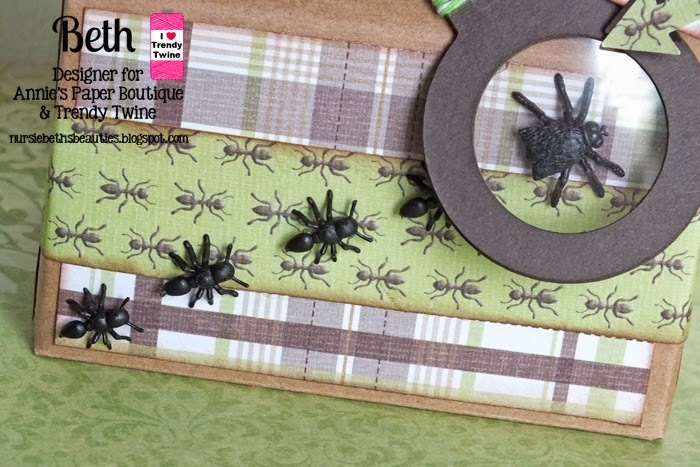 The monster border was tucked in behind the photo mat which was embellished with the Limeade twine. I also paper clipped a heart to the photo mat adding some twine to the paper clip as an accent. The word bubble was stamped with a sentiment which seemed so perfect for my layout. I added a few enamel dots as accents. As a finishing touch the monster got some twine hair to jazz him up a bit. I curled some of the twine to give it more interest. 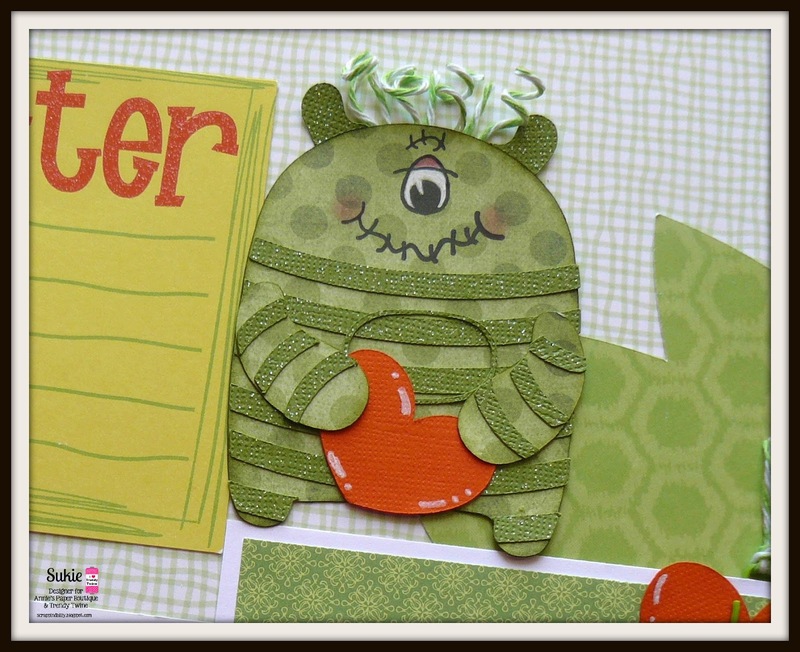 Thanks for stopping by to check out my "monsterific" layout. You can stop my blog for more details on my layout. 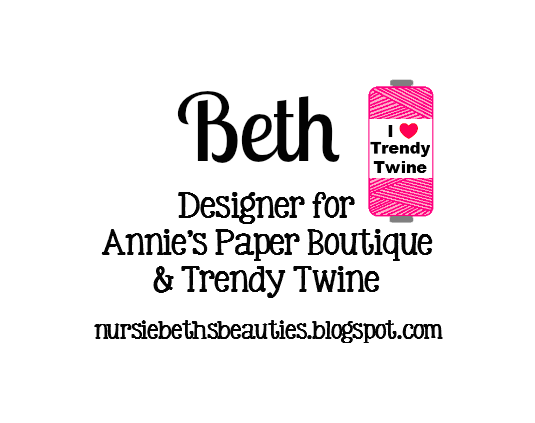 Remember to shop at Annie's Paper Boutique for 81 flavors of twine and so many other crafts and packaging needs! Have a great day! Who is hanging out at the end of the rainbow? St. Patty's Day is coming, so could it be a Leprechaun? I thought this guy was just too cute the second I saw him. This is Melissa from M Miranda Creations and today I am sharing another project with you featuring this month's showcase - Limeade Trendy Twine. I started with an A2 size card base. 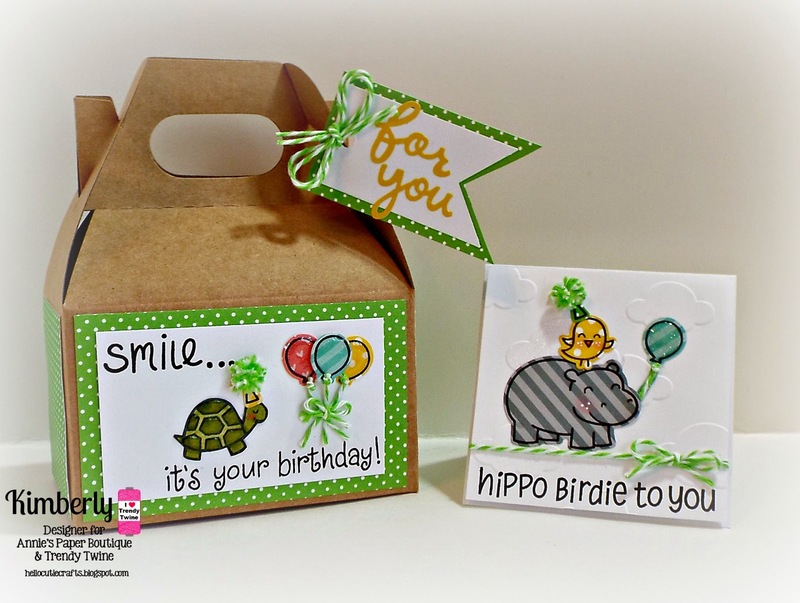 I added a background from Doodlebug Design's Happy Go Lucky papers. I wrapped the top with my Limeade Trendy Twine and used it to attach my tag. The sentiment is from My Craft Spot. 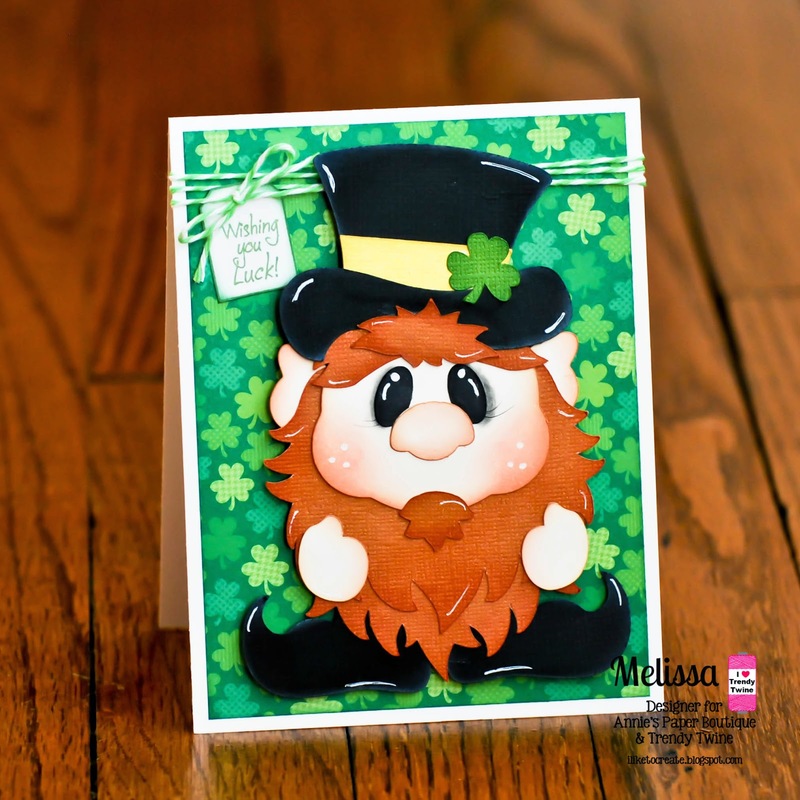 I then used pop dots to attach my leprechaun from Cuddly Cute Designs. I'm so excited about how it turned out!!! Hi everyone! I'm Helen from HTB Creations. 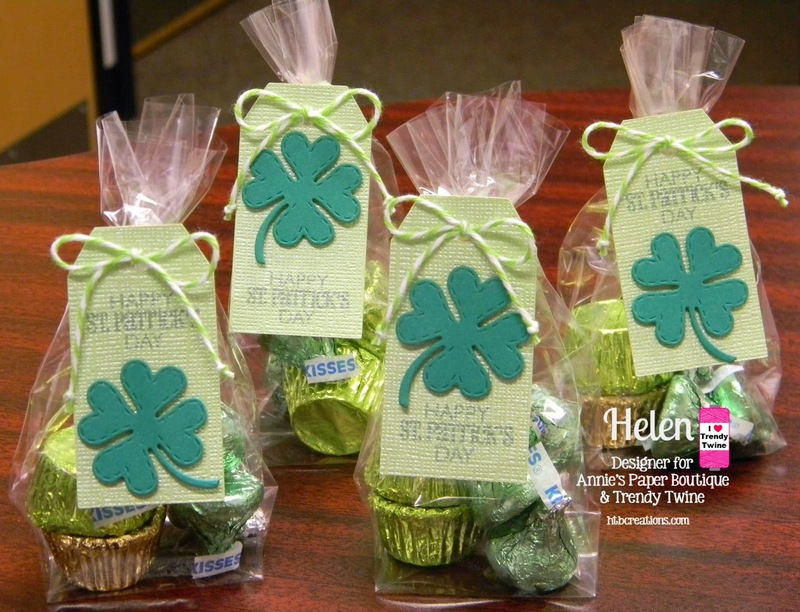 Today I have some quick little treats for St. Patrick's Day that were super quick to make. 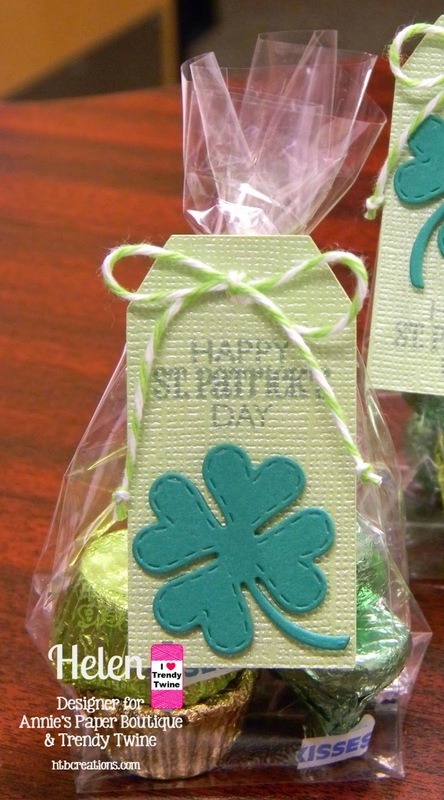 I used the fabulous Limeade Trendy Twine and some really fun Small Candy Sacks from Annie's Paper Boutique. I totally misjudged how big to make the tags (as I frequently do). They were so cute, but I didn't know what I would use them for. 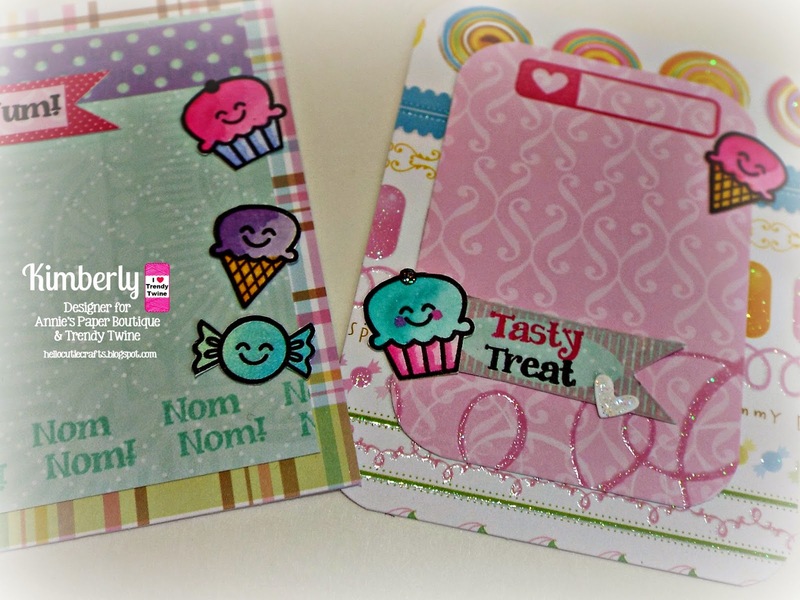 Then I found these great Small Candy Sacks from Annie's Paper Boutique in my stash and thought they would look so cute with the tags on them. The Candy Sacks come in a 10 count from the store--I love that they are flat bottomed. Kimberly from Kimberly's Crafty Spot to share a project. For my project, I made a Birthday gift set. with so many things, a gift card, candy, money, etc. For all the details of my project, check out my blog.